Huawei's All-Brand Honor has been very aggressive in the Indian market in recent days. The company has released several smartphones in different price segments. Just 6 months back the Honor 7C was launched. Now the Honor 8C has been launched in the market, which comes with 4,000 mAh battery, 6.2: 6 inch display with 19: 9 aspect ratios, camera equipped with AI and out of box Android 8.1 Oreo. It is also the first Smartphone to come up with Qualcomm Snapdragon 632 processor. There are two variants of Honor 8C. The price of 4 GB RAM and 32 GB storage variant is 11,999 rupees. On the other hand, 4 GB RAM and 64 GB storage variants can be purchased for Rs. 12,999. Honor 8C body is plastic. Build Quality is Satisfactory. But this does not seem to be as premium as the price segment of glass and metal body handsets. If seen, Old Honor 7C also came with metal blackplate. There is some difficulty in using this phone with one hand. The Nokia-equipped display is really not without a border. There is quite a chin in this. There is an option to hide the Nokia in the settings menu. In this feature, the side of the nouch is actually black. If you want you can choose one of the on-screen buttons and EMUI's gestures, which we have trouble using. Glossy plastic back fingers are easily dropped. The phone easily slips in the hands too. There is a soft cover in the retail box. Its quality is not very cool, but the phone gets protection from scratches and the grip is also good. A 10-watt charger is also provided in the retail box and there is also a Micro-USB cable. Headset can not be found, which can frustrate some users. Camera is provided in vertical position on the air panel. The fingerprint sensor is in the center of the device. 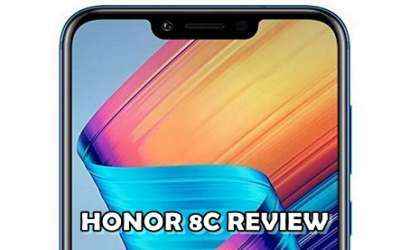 Honor has tried to duplicate the backpack with its own Honor 10 GradeInt Color in this phone, but it has not been completely successful. We did not like the black and blue gradients found for review. There is a SIM tray on the left side of the smartphone. There is a separate slot for two Nano SIM and MicroSD card. The power button and volume rocker on the right side of the model phone. Buttons are small, but the response is great. At the lower end there is a micro-USB port, primarily microphone and speaker, which is small but gives a higher sound. Secondary microphone and 3.5mm headphone jack have got place in top. It is disappointing to see Micro-USB port during the USB Type-C port. Qualcomm's new 14 nm snapdragon 632 processor has been used in Honor 8C. We have reviewed the variants of 4 GB RAM and 64 GB storage, which is worth Rs. 12,999. There will also be 4 GB RAM and cheaper variants with 32 GB of storage. It will cost Rs 11,999. Both mobile variants will support MicroSD card up to 256 GB. The smartphone has a 4,000 mAh battery. It will run on the eMUI 8.2 based on Android 8.1 ORIO Connectivity features include Wi-Fi 802.11b / g / n, Bluetooth 4.2, GPS, GLONASS, Micro-USB port and 3.5mm headphone jack. The phone has 6.26 inch HD + (720x1520 pixels) TFT IPS LCD display. Asspect ratio is 19: 9. The display is not complimentary. The viewing angles are fine. Colors panques come. Brightness level is not enough. Text and Image Sharp do not appear due to HD + resolution. The performance is fine. In common use the smartphone plays with good. But more seems to be lagging behind in the task. During the navigation in the UI, we also felt a slight lag. This problem was also seen in scrolling heavy websites on Chrome. Honor 8C is the world's first smartphone with Snapdragon 632 processor. It is unclear whether the performance decrease is due to the processor or there is a lack of optimization in Honor. Complaining about frame rate drop during playing Asphalt 9 and PUBG games. But we can not play games. Face recognition works fast. This feature worked fast when there was enough light, but you have to put your smartphone in front of the face. Increases the brightness of the phone screen in low light, so that it can be easy to scan the face. This feature is somewhat effective. We also found fingerprint sensor to be fast and accurate. Based on the Honor 8C Android 8.1 Orio, EMUI 8.2 runs on custom ROM. EMUI is a custom ROM equipped with many features, but it seems very confusing and many unwanted apps are also part of the UI. There is an odd blend of Google's own app and the default app of Honor. For example, there are Chrome browser and Android's default messaging app, along with dialer, file manager and gallery's custom version of Honor. Facebook, Messenger, Netflix and Camera 360 are already installed. In addition, the company's app, such as HiCare, Huawei Health, Themes, Honor Store and Honor Club, has also got place in advance. It is a good thing that EMUI also has a forest handled mode. In our HD Video Loop Test, the Honor 8C battery lasted 14 hours and 30 minutes. These figures are the best. Performance is also solid in common use. Battery will be easily with you all day. There are several power saving features in EMUI. One of these features reduces screen resolution and reduces when the battery is low. Smartphone does not support quick charging. The 10-watt charger in the retail box takes about two and a half hours to complete the charge of the phone. Honor 8C has a 13-megapixel primary rear camera with F / 1.8 aperture. With this it works as a 2-megapixel depth sensor with F / 2.4 aperture in Jugalbandi. The front panel has an 8 megapixel camera with F / 2.0 aperture of this phone . Both camera setups come with single LED flash. The iOS-inspired camera app has many work features. It also has a pro mode in which the user can control ISO, exposure, shutter speed and white balance. The smartphone can identify select subjects or scenes being shot and then optimize image settings. At present, the smartphone can detect 22 different objects and 500 scenes. We did not like AI enhancement. While shooting in AI mode, the pictures were sharper than necessary, and the colors were too much retarded. When the AI was closed, the colors were more natural in pictures taken in sufficient light and the exact details were also present. In wide aperture mode you can take pictures with depth of field effect. These photos got slightly better than average However, image quality came down slightly from other phones in this price range. If there is not enough light, the pictures taken from this phone came from Dark and Merki. At times, Autofocus was also struggling. With the help of AI enhancements, the app can capture a bit more light. But the lack of detail in the pictures and the problem of Noyase remains intact. The front camera is also fine. Most of our pictures came in soft and over-exposed. The performance was very poor even in low light. Front flash is helpful to some extent. But there is lack of detail in pictures. Colors do not come true and the photos look superpensive. Beauty mode is also available for front and rear camera. But the photos look artificial. There is also support for AR Stickers. You will be able to record the maximum 720 pixels of video from the front camera and 1080 pixels from the rear camera. There was lack of detail in our test video and due to no stabilization, video shakey was also recorded. Honor 8C is not something that is able to challenge the smartphone like Asus ZenFone Max Pro M1 and Nokia 5.1 Plus. Honor has tried to make an all-rounder device, but this phone is not strong in any one department. The phone looks neither premium nor does it feel like it. Its performance in low light is disappointing. The common performance is fine and the user interface is cluttered. Battery life has breathtaking. You get a microSD card slot separately and the fingerprint sensor is fast and accurate. Brands like Xiaomi, Nokia, Asus and Realme have raised the race for the budget smartphone segment. In such a situation, Honor needs to do more to come up top.